Are you tired of paying on a credit card forever, while the balance never seems to go down? If you are ready to mount an all-out attack on that nagging credit card bill, this calculator will help you to formulate a plan to get rid of it once and for all. How many months it will take to pay off your balance at a given payment amount. Or, tell you how much the payment needs to be to pay off the balance within a given number of months. In either case, the calculator will also tell you how much interest you will end up paying, plus provide you with a printer-friendly payment chart that you can print out. If you're like me, you charge certain reoccurring expenses to your credit card -- partly to earn the rewards, and partly to avoid potential overdraft charges from having these expenses come out of your checking or debit card account at an inopportune time. Knowing that is the case for most people, the calculator includes these future monthly charges in your payoff plan -- plus tells you how much your payment will be if you stop charging to the card. This means that if you leave the payment amount the same while removing the future monthly charges, you will also be able to tell how much sooner your balance will be paid off if you stop charging to the card. Calculate credit card payoff month and year, or the monthly payment needed to pay off the card within a certain number of months. If the card charges an annual fee, enter the annual dollar amount. Enter as a dollar amount, but without the dollar sign and any commas. 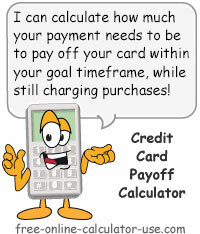 The calculator will add 1/12th of this amount on top of the monthly payment amount needed to pay off the card. If you will be charging to the card while you are paying off the balance, enter the average amount you expect to charge each month. Enter as a dollar amount, but without the dollar sign and any commas. The calculator will add this amount on top of the monthly payment amount needed to pay off the card. If you want to see how many months it will take to pay off the card at a given payment amount, enter the payment amount here. Enter as a dollar amount, but without the dollar sign and any commas. Otherwise, leave this field blank and enter the number of months on the next line. If you want to see what the payment would need to be in order to pay off the card within a specified number of months, enter the number of months here. Otherwise, leave this field blank and enter the payment amount on the line above this one. Select the month and enter the 4-digit year of the next payment due date. This is the total monthly payment used in the payoff calculations. Note that this figure includes 1/12th of the annual fee (if applicable) as well as the future monthly charges (if entered). Based on your entries and on the above payment amount, this is the number of months it will take to pay off the card. This is how much interest you will pay on the card between now and when you achieve a zero balance. Enter the monthly amount you will be charging to the card each month if any. Number of months to pay off card. Tap the "Calculate Card Payoff" button and scroll down to view the results, which includes a payment schedule and a button for creating a printer-friendly report.